We can’t think of a better layout for a bachelor than a large, open entertaining space highlighted by incredible views. That’s exactly what you’ll find in our one bedrooms in the A3 line at Quinn. 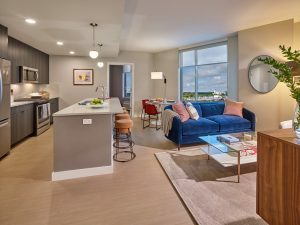 Your guests will be impressed with sweeping views of the river stretching out to the Statue of Liberty, down to the luxury finishes inside the apartment. Although Quinn has a plethora of amenities designed for entertaining, you won’t need to venture upstairs as your home will be the perfect backdrop for hosting. 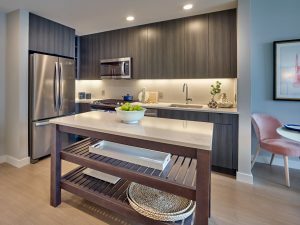 With a well-appointed kitchen with modern appliances, you will have everything you need to keep the beers cold and display food for your guests. Now the only question is: who will you have over to visit first?